To cut a round tube and rejoin it mitred at right angles – this was the idea of the architect Robert Mallet-Stevens (1886 – 1945), whose lever handle is today known as the "Frankfurter Model". 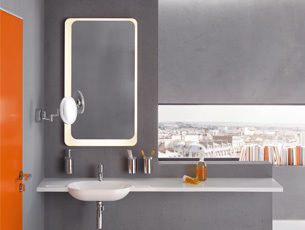 HEWI has derived a universal system on the basis of the simple yet clever design. Linear, functional, without superfluous details: System 162 convinces in the sanitary room through its clear design. Matching hardware, signs and handrails made of stainless steel are available. The minimalist design concept of System 162 not only has a convincing reduced design and a high degree of functionality, but also persuasive quality to match. 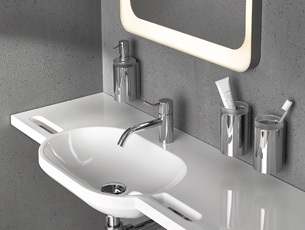 The System 162 sanitary products are available in stainless steel or with a high-quality chrome finish. The accessories can be combined with inserts made of satin-finish glass or high-quality polyamide in signal white, pure white, jet black or anthracite grey. System 162 is augmented with a rail with shower head holder and shower basket. The support rail provides additional comfort and convenience.